One evening in May towards the end of the 19th century, at around seven o’clock, the Sheriff Substitute of Wick (the deputy sheriff) was summoned to a druggist’s shop in Wick, where he found a young man lying injured on the floor. A couple of doctors were in attendance and they gave their opinion that the youth – a cooper who had just turned 17 a couple of months before – was losing so much blood from a wound in his neck he was unlikely to live. The statement was written down and read back to him, the unfortunate young man being too faint by then even to sign his name – and indeed, he died shortly afterwards. The killer, who was only aged 20, was arrested the same evening, and a year later was convicted of murder and sentenced to 10 years. I came across this “dying deposition” in the archives of the local police force, and it made quite an impression on me – I mean, how often do you come across someone’s dying words? Curious, I looked up the case and found a record of the conviction, which also included a description of the killer (long face, fresh complexion, brown hair, no whiskers, long nose, thin cheeks, large mouth, grey eyes, able to write well). It’s hard not to be moved, the poor young man bleeding to death on the floor of the chemist’s shop, surrounded by strangers, struck down by his friend in a blind rage. Sometimes archives can bring the past a lot closer. 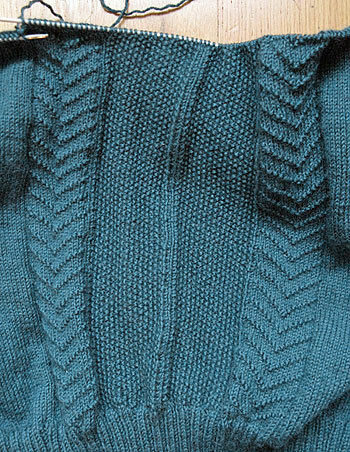 In gansey news, I’m about an inch and half away from starting the yoke and the gussets now, maybe another week’s knitting, depending. I’m close enough that I keep getting out the ruler and staring in disbelief at how little progress I’ve made since the previous measurement. But many drips wear away the stone, as the Welsh proverb has it. Time cures all ills. By the way, remember how last week I mentioned John o’ Groats in an unflattering light? Well, I looked it up on Wikipedia and learned that the Lonely Planet guide describes it as a “seedy tourist trap” and in 2010 it was named “Scotland’s most dismal town” – so it’s not just me. 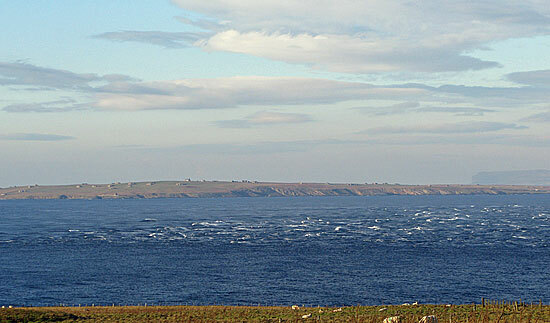 Turns out the distance between John o’ Groats and Land’s End is the furthest distance between two inhabited settlements in Britain, but the actual north-east tip of Scotland is Duncansby Head, just a couple of miles further on. You reach the Head down a narrow road which ends in a car park; there’s a lighthouse, and a pretty good view over the sea to Orkney. 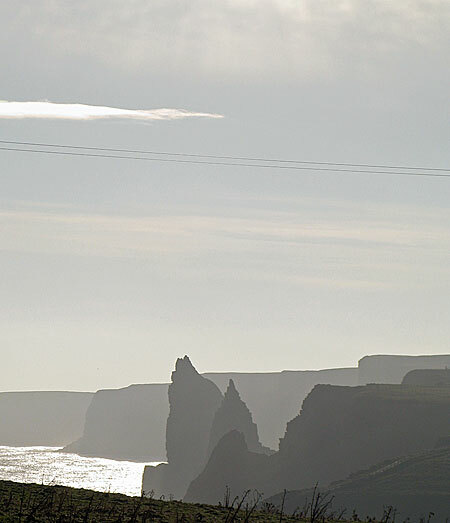 But if you cut through the fields, and walk to the south side of the promontory, you’re rewarded with sight of the celebrated Duncansby Stacks, jagged great rocks rising out of the ocean like filed and broken teeth, one of them forming a vast arch. On the day we went it had been raining steadily and the grass seemed to be floating on a lake – it’s the only time I’ve seen grass ripple, in a Grimpen Mire/Marshes of the Dead sort of way – so we didn’t explore too closely, for fear of being sucked below, or finding pale hands clutching at our ankles. We’ll go back next year, when the weather improves; I’m told it really does. Honest. In a funny way, I feel sorry for the killer as well; imagine what he thought later when he realised he’d killed a friend. Life is complicated, sometimes. I wonder if you couldn’t do some sort of rotating History Of Wick thing in the library as part of the Archivist Duties. I’m sure you already have too much to do, though, so never mind me. I hope you get to gussets soon! Yes, it’s how these things really happen, I think – a tragedy for all concerned. There are many unanswed questions still. What was the quarrel about? Was the man with the knife drunk? What had pushed him over the edge into that kind of fury? I think there must have been mitigating circumstances, because 10 years is a relatively light sentence for murder. I’d be reluctant to commit myself to a series, because in a sense it’s pot luck finding this kind of human interest story, something that goes beyond externals into what makes people tick. As for the gussets – how long, oh Lord?! Those are stunning photos, Gordon, I especially like the subdued lighting of Duncansby Stacks. Hi Lynne, that’s the bonus of having Margaret behind the camera – she looks for light and framing shots – I’m more of a point & click man, myself. Having spectacular geography to shoot helps, of course! Risking being sucked into the mire – sounds like my back yard, which I just set foot in for the first time in a while. I admit it has been raining lately, but not that much. 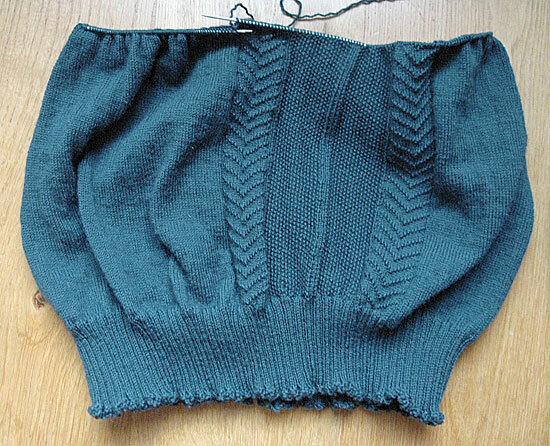 From my viewpoint, your latest gansey is progressing nicely; it reminds me that I really should knit something else this year besides the one hat.